Looking for private in-home or in-studio Music Performance lessons? Our Wheatland teachers are ready to get you started. Find your teacher today! Check out some of our most popular teachers near Wheatland, OK including Oklahoma City, Edmond, Arcadia, Yukon and Piedmont. Teaches set-up, how to deal with choreography, tone, acoustics etc. from Latin, classical, blues, all the way to heavy metal. I have a lot of on stage experience that has served me well, and my mission is to give back the inspiration that has been my love for music. I have backup amps and guitars just in case. I bring all the materials for the lesson plans to the student's home. classical, rumba, metal, classic rock, hard rock, shred, Brazilian, fusion, blues, and most Latin styles. Brandon is a great teacher. I had my first lesson with him yesterday and he can play and takes the time to show you exactly what you are doing. I was skeptical of an online lesson with a teacher but it was a blast and in my first lesson I learned a lot of valuable things that I can put in my toolbox. I look forward to learning and to keep taking lessons. Oh and practicing! Highly recommend Brandon. My first lesson with Brandon was a really instructional and inspiring interaction. Brandon listened to my goals and inspired me to become disciplined in practicing every day. His future classes and goals for me where explained after the first class. Both he and I have an understanding of where I want to be in the future and I know he will do everything he can to help me achieve my goals. Thanks Brandon! Excellent instructor. Professional with lots of patience and encouragement. I am looking forward to my next lesson. Performance for recital, concert and any event in which one sings or plays for others! Do you already have a few years of study under your belt? Lessons that center on Music Performance look into the connection between performer and audience. In lessons we work on getting the message conveyed from the stage to the listener, and discover new ways to enhance the experience for our audience. As an educator, I've had experience teaching both young children and adults in many settings, whether it be in a classroom, small group lesson, or one-on-one. I pride myself on providing lessons that are uniquely individual and foster a students strengths while also building on their weaknesses. The best part about being a music educator is that I get to share my love of music with all of my students. With that said, whether you are a beginner who's interest has been sparked, or you have aspirations of becoming a professional musician I can help you there! e encouraged to take risks, try new things, make mistakes, and most importantly be themselves. I value the time I have with my students and expect each student to come prepared to each lesson with an open mind and willingness to work. With music, the best results come to those who put in 100% both during lessons and during individual practice time. This is key in any musical pursuit. Overall, I want lessons to be enjoyable while still maintaining a sense of progress for the student. In 2005 I made my operatic debut in Italy with Operafestival di Roma in their main stage production of Mozart's Le nozze di Figaro. While in Rome, I was also featured in Pergolesi's Stabat Mater. Over the years I've been featured as a soloist in other concert and oratorio works such as Villa-Lobos's Bachianas Brasileiras No. 5, Rutter's Requiem, and Mozart's Requiem. Along with my classical training, I've taken on several roles in musicals such as, The King and I, Guys and Dolls, Oklahoma, and The Boyfriend. I am an honored NATS (National Association for the Teachers of Singing) competitor, Peabody Scholarship recipient, and Bland Music Scholarship recipient. Recently, I had the opportunity to work with the Richmond Philharmonic Orchestra on their spring and summer concert series and was asked to perform the National Anthem and God Bless America at Game 2 of the ALDS during one of the MLB's 2014 postseason games (Baltimore Orioles vs. Detroit Tigers). When I'm not singing, you may find me enjoying a run through the neighborhood, or enjoying some time with my cat CJ. I earned both my undergraduate and graduate degrees form the Peabody Conservatory of Music of the Johns Hopkins University. Studio space with piano, recording equipment, and parent seating available. Classical, Musical Theater, Pop, Jazz, Soul, and Country. I had a really great time and she explained so much to me that I wasn't really clear on. My daughter really enjoyed her session with Chelsea! She is very knowledgeable and very thorough! Best vocal instructor our daughter has worked with! Amanda has performed with cover bands in several different genres; rock, jazz, R&B, and country. She is also a singer/songwriter that has performed nationwide. 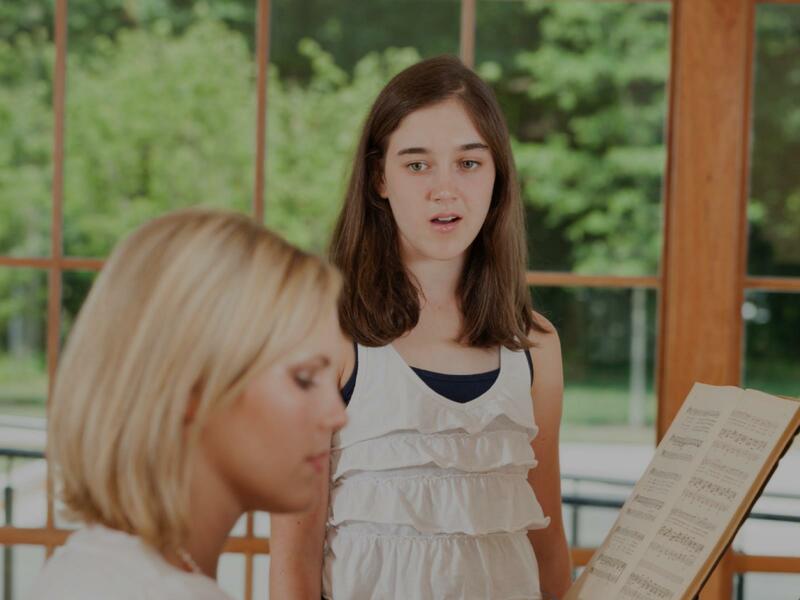 Amanda loves to coach singers in music performance and how to tell a story through the song as well as learn their own unique voice and how to make it shine the most. What can often be the most important part of a performance? Stage presence! Liz teaches students how to be more comfortable on stage, and hold the attention of a crowd! Experienced playing in front of many different audiences, i.e. big audiences with Holland America Line, from 75 to 1000 people in the audience. Dealing with other musicians and the audience is as important as the performance itself, at times. our group of eight (8) played in front of high-school, middle school and Convention size audiences. How to play and not lose focus playing your instrument is key. You are there to perform and share your musical talent. At different churches, some places were over 300 - 1000, depending on the size of the building, or course. At lessons, we can talk how to play, read music for musical performance, and what to do after the performance. Using "battle tested" methods from years of performing, I will help you prepare for upcoming gigs, recitals and auditions. 1. Praise students to success. 2. Teach in all areas simultaneously: Notes, Symbols, Performance, Music Theory and musicality. 3. Use many and various music styles including electric piano techniques, jazz, ragtime and classical. Knowing my students desires and goals are of the utmost importance to me and I strive to find out how to engage them and grow along together! Can't find a teacher in Wheatland, OK?